Honeymoon period with the Yonex VCORE 95D? But as I’ve said before, you shouldn’t play with a racquet because one of your favourite players use it. A racquet and its setup is highly personal and should fit you, it doesn’t matter if it’s used by top 10 player or not. As you know, professional tennis player racquets are not the easiest to swing for recreational players and don’t believe that they play with the specs in the marketing lingo. Pretty much every serious tennis player will customize their racquet in some way although there are of course exceptions to this. We’ve all been in a racquet honeymoon period (read my previous post about this topic) where you’re sure the racquet is THE ONE for you and a one month later you put it up for sale. I’m not sure if this is another honeymoon period or if I’m actually going to play with this racquet for like half a year at least, but it sure feels good these first few hits. 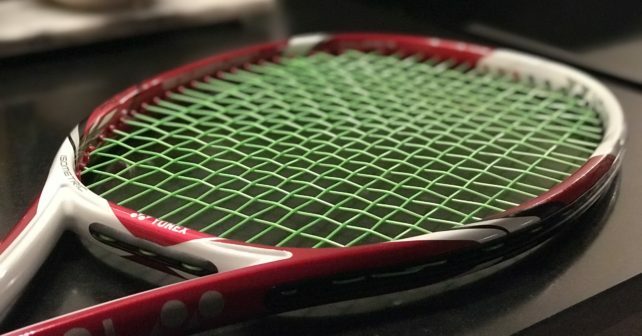 How would I customize the Yonex VCORE 95D? Not sure yet, for now I don’t have a smudge of lead tape on it and it plays great. Yet, I usually like a high twist weight and might add some weight at 3 and 9 o’ clock which I’m prone to do with all my racquets. What does Stan Wawrinka add to his racquet? You can either click his name or check out his specs below. Looking at Stan the Man’s racquet specs, they do look rather close to my own preferences in a tennis racquet. The main difference being that he actually enjoys playing with Babolat RPM Blast strings (I used to do this before I realized there are better poly strings out there for people who are not keen on re-stringing their racquets every 6-8 hours of play) and that he adds around 12-15 grams more in weight to the racquet. So as a fun experiment I’m going to see if I can mimic his specs and see how that frame feels like. I’ll might even string it up with RPM Blast for the heck of it. What I can say about the Yonex VCORE 95D already is that it offers good spin and control in a manoeuvrable and comfortable package. Why they discontinue racquets like this is hard to understand. The VCORE 97 series are also good racquets, but being a fan of 95 sq inch tennis racquets, this is the kind of racquet I want to find in the store. Below you have another “therapy session” video of me hitting tennis balls on a large rectangle. I’m going to work on my video game from now on, but this will have to do for the time being. Thanks to Mathias for another enjoyable session on the court. He was better on the day, but I’m starting to find my groove after a slump-ish period. As a sidenote to this, I really respect the quality control and finish on Yonex racquets. The paint jobs are also top notch and they do seem to use a high quality graphite. I’m not saying they’re better racquets, but sometimes “Made in China” can be a little disappointing and this is why the HEAD frames of yesteryear from Austria and the Czech Republic did seem like more high-quality products. This might be a broad generalisation and I’m sure there are high quality products made in China, but I’m definitely not the only one who feels this way. Have you tried the Yonex VCORE 95D? What do you think of it? And what do you think of Yonex racquets in general? I enjoy yonex racquet been playing whith yonex vcore Tour 97 (310g) for some time whit lead at 12. for me it feels like yonex have a bigger sweetspot and are more forgiving in less perfekt hits.. I have also heard you shude string yonex 1kg less in the main bec of the shape of the racquet?? Is this tru?? I like to try the 95d! Does it feel smaller when u play than a regular 97-98 head size. Have you hit with either the Dr98 or VCORE Duel 97 G? Would love to know how it compares. Aside from the head size and beam, they seem like fairly comparable racquets. I’ve been looking for a softer (lower powered) replacement of my old nSix.One 95 gamer racquets. This sounds like it could be the one, but I’d want to demo something comparable. I’ve hit the DR 98 and that has a similar response when it comes to stiffness as the VCORE 95D, but when it comes to beam and feel through the air it’s more of a Wilson Blade. You get a bigger sweet spot with the DR 98, but the VCORE 95D moves faster through the air. Both are great racquets in my opinion. I haven’t tried the VCORE Duel 97 G, but heard a lot of good things about the 310 gram version. If you want a softer nSix One 95, the VCORE 95D or the Prince Textreme Tour 95 with some lead tape at 3 and 9 could both be ideal replacements! Thanks Jonas! I really enjoy Tennisnerd, would love to be able to test and tinker with as many racquets as you. See if you can get your hands on a VCORE Duel 97 G 310. It looks great on paper and you could easily lead it up to your exact specs. Thanks for all the awesome content. I have played with Yonex since the early 90s. Their quality control is unmatched and their high end racquets are all made in the same factory in Japan. I still play with the RD-7 and Super RD Tour 95. (Hunting down new old stock was quite a process.) My one problem with them is they really have never produced a “legacy” racquet like the pro staff, prestige, PT 57 or Prince Original Graphite. Enjoy the 95D…I found it very string sensitive, but with the right set up it’s an outstanding racquet. Great blog by the way! Thanks for your comment, MJ and I really appreciate that you like the blog. Never tried the Super RD Tour 95…what strings did you try/like with the 95D? Love the response, but need to tame the power so going to string it a bit tighter. The Super RD Tour 90 was used by Krajieck and Hewitt (For a long, long time under paint jobs), Iva Majoli used the 95 to win Roland Garros in 97 and Hingis used it in the 96′ season….Daveydenko used the RD Tour 95 very early in his career. I enjoyed the 95D with a full bed of Cyclone @58 lbs. When I used a hybrid I used Pacific Tough gut in the mains @ 62 lbs, and BB alu power rough in the crosses @ 56 lbs. I prefer firmer string beds. Hope you enjoy the 95D and keep up the great work! What’s the strung spec of this frame? The one I use in the video or just the uncustomized Yonex VCORE 95D? It’s 325 grams unstrung so around 340-345 strung depending on overgrip and dampener. I tried various customizations from 350 grams to 365 grams and enjoyed it best with just a little lead tape at 3 and 9. As I commented on your video this 95D is cool first Yonex that I have hopefully this will be my go to I was thinking of lighter than this because I think it’s heavy for me but I have tried playtesting a Tecnifibre vo2 max 325 and I handled that so I think that I can handle this one too and I was right. This is a 95 but it feels like a hundred no stress on the arm so far I think one of it’s downside is the grip shape and when you hit a heavy low fast ball you have to add up some spin to your shot to control the depth I don’t know maybe it’s just me or what. But overall this is great the one that shows on mine is made in japan in other forums some says that there is made in china. I really enjoy the reviews you post. I have been playing for approximately three years with Angell TC95 16×19 63RA, 341g strung and 9pts HL. I like the comfort of the racquet, since I’ve had tennis elbow with stiffer racquets (used to play with Pro Staff 90). However, the somewhat elongated had format bothers me. I appreciate a more rounded head for contact. Along with that, I am looking for better control (I had great control with the Powerbridge 10 Mid, which I used before the Angell) and maneuverability, along with a bit more power. I recently bought an Ezone DR 98 to see if it would fit these requirements, but only had one training session with it. Reading your reviews, I believe you could help me with your experience. In which direction should I move from the Angell (Ezone DR 98, VCore 95D, stick with the Angell with some adjustments or any other suggestion), or at least expect in gain/loss from such transitions. *just being more precise: I guess I felt greater maneuverability with the PB10 Mid, maybe even more than control itself. Thanks! It sounds like you have a pretty good setup already, but sometimes you just feel like a change. For rounded heads I would check out Prince and possibly a Phantom Pro 93P which you could string low for more power. It would be slightly crisper than your PB 10 Mid but the same head size. Sounds like you are more into classic sticks than the DR 98, but sometimes a bigger head size just makes life easier on the court. You would need to give it some time to feel if you could enjoy switching to it. The slice will likely feel less good, but you will definitely have a bigger sweet spot and more spin. I do not think you will find the control and manoeuvrability you are looking for if you are used to midsize racquets. The VORE 95D is a great racquet and if you manage to find one, definitely worth a test. It will feel crisper and more powerful than the TC 95, but the sweet spot is bigger and I think you will enjoy the feel from the string bed. I always recommend people to stick with their racquet they’re used to if they are playing well with it, but sometimes it is just nice to change it up a bit. The Angell is a great racquet, but checking out Prince or Yonex could be an interesting experiment for you. So I think the Prince Phantom 93P (control and manoeuvrability) or the VCORE 95D (more power and spin) could be an interesting test for your game. Remember that strings make a big impact on how a racquet feels so just changing your string setup could be an option as well. Thanks for the feedback. That helps a lot. In terms of head format, just by looking, I find Murray’s and Cuevas’ racquet head size and format are perfect! They seem so proportional and controllable. They attract me even more than the VCore 95D in that sense. It has been years since I admire how they appear to be: simple, perfectly sized with a very “sober” head format – slightly elliptical, being just a bit wider near the hoop – and optimal for doing what you wish to do with the ball. This, along with the fact that they are flexible, makes me think if they are worth a try. Even though they are rare to find (PT57A and PT57E, is that correct? ), and if found, very expensive, do you think they might also be a good substitute for my TC95, for what I am looking for? If not, would you recommend a racquet that shares their properties (mainly mold, flex, maneuverability…), but plays closer to what I am looking for? P.S: I have a one-handed backhand. *If you could also please compare the 95D to the Wilson Ultra Tour (which seems like as more accessible retail version of H19, which is somewhat similar to PT57A), it would also help in my purchase, given the characteristics I’m looking for. Thanks a lot. 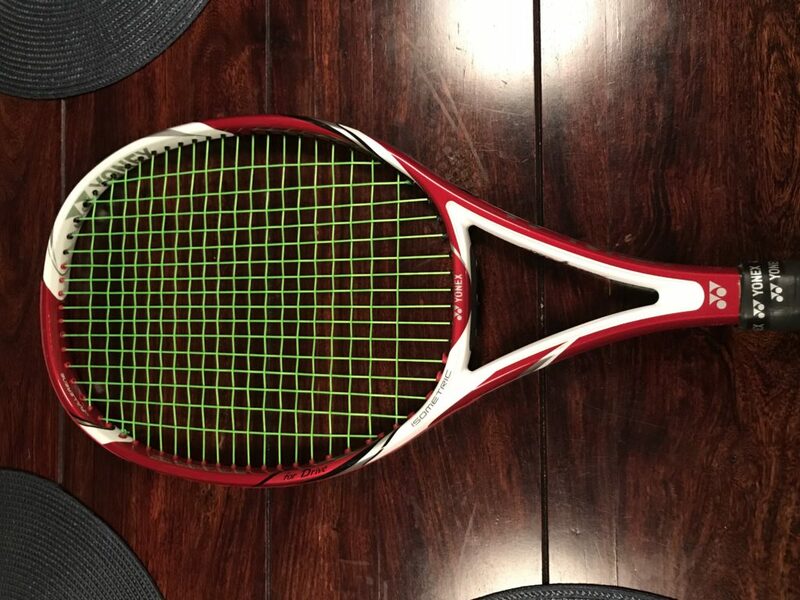 if you compare this Racquet with the actual VCore 95, do you think they play somewhat alike? Otherwise do you no, where to get an actual 95d?